Arora Rift conversion for Pandora with new 32-bit graphics. 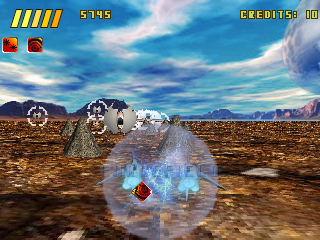 Arora Rift 32X is back in this brand new action packed version for OpenPandora with all new 32-graphics. 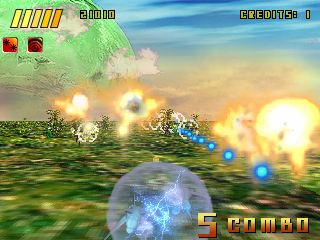 With all the sci-fi shoot em' up elements and classic arcade looks and feel from the original Caanoo version, you have to give this one a go! You take control of the Arora, a high-tech and deadly space fighter, and fight off the swarms of enemy drones and fighters coming at you. all the way to the enemyâ€™s base. 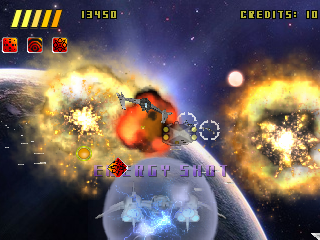 With the brand new 32-bit graphics, Arora Rift 32X brings you crisp looking graphics with intense and colorful effects and big and beatiful explosions. All this in the original Mode7 pseudo 3D perspective that really makes you a part of the action! "Arora Rift 32X" is a product of Black Curtain Studio.Copyright Â© 2011. All rights reserved.You may NOT copy, resell, attempt to hack, redistribute or make derived works from any of the contents of this game. @onpon4: Minor updates in a near future is possible, when I have less stuff on my table. If you have any issues with the game that prevents you from enjoying the game, feel free to send me an email. I'm considering making a review of this game soon. Unfortunately, though, my opinion of it isn't exactly high, so I want to ask first: do you have any intention to improve this game at all in the near future? If so, when and how? Not too shabby. My biggest complaint is probably the controls, which are kind of awkward. A manual would also be great.